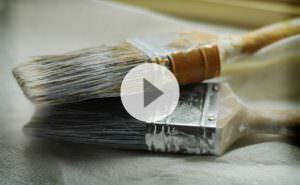 How to clean an Acrylic paint brush with “The Masters” brush cleaner. Morning class, I’m Will Kemp from will kemp art school and today I’m going to show you how to properly clean an acrylic brush. I use absolutely loads of kitchen roll when I’m working, and you just kind of rub it into it. This really helps to kind of soak out all the pieces of pigment that get stuck in here the bottom of the brush. That what we want to really try and get out. The real trick is to use a brush cleaner, just make sure it’s a little bit moist onto the brush. I just work it around into the middle of the pan slightly, and then you just work it into your hand. The lather that is being made starts to bring out all of the red pigment that was in the brush. That you couldn’t easily see before. And another round with the lather, the brush cleaner, and you can kind of work that in as well. Once it gets to this level, all I do is run it under the cold tap, just keep on working that lather through it. Dry it off with kitchen roll. And then make it into the shape of the brush. This cleaner is a preserver as well, so if there is a little bit left on it it doesn’t matter in fact it will be good for the brush, then just leave it on the horizontal. You don’t want to hold it like this (upright) because a little bit of moisture will come down into the bottom of the brush and your brush bristles will splay out, so keep it on the horizontal, leave it to dry and you’re ready to go. 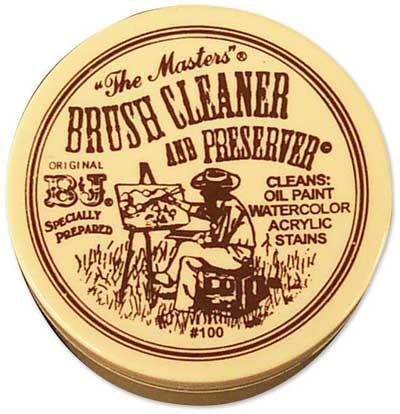 The Masters brush cleaner: I’ve found this to be one of the best brush cleaners around, you can use it with Acrylic paint and Oil paint and it can even revive brushes that have hardened on paint. It rocks! Thanks for the tip, brushcleaning has always been a big hassle and this just looks awesome. Unfortunately I had to import it from the US but atleast the shipping rates weren’t too high :). Thanks for creating such a great website – I’m finding it really useful! I understand the importance of cleaning the brush thoroughly after the painting session has ended, but what about during the session? If I finish using a brush but know I may want it again, how can I keep it “nice” without washing it properly? Can I leave all the brushes used in one session till the end before washing? If so, how? – I don’t want them to go hard, but keeping them in water is also not a good idea. Obviously I would get as much paint out as possible before putting the brush aside, but is there a time limit before it all goes to pot? I always clean my brushes thoroughly in water, squeezing out the excess water onto some kitchen roll, even if I have finished with that brush but might want to still use it later in that session, I just wouldn’t use the brush cleaner until the final clean up for the day. Although this seems like a lot of washing, Acrylics are unforgiving and can harden on a brush within 5 minutes so it is a really good habit to get into and it’s not until you’ve ruined your favourite brush that it becomes second nature! I agree with keeping them out of water, but I do keep them damp. As long as they’ve been cleaned thoroughly in water, squeezed on kitchen roll until they’re damp, they will keep nice until the end of the painting session for a more thorough clean with brush cleaner. 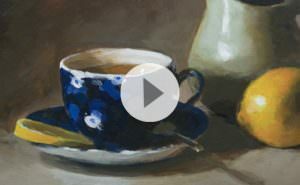 I’m so glad I don’t have to keep reaching for the soap every few minutes – I’d never get any painting done!! Is acrylic painting hard to do? Hi Ajithganil, no acrylic painting is very straight forward, all you really need is some paint, water and a couple of brushes. You can paint on any surface from paper to canvas. It’s a great medium to start to learn about painting. Hi Will, I am a beginner and am so excited to have found your site. My first, of what I am sure will be many, question is: Cheap Joe’s Art Stuff, which is in Boone, NC, USA, sold me Silicone Brush Cleaning Fluid and a Silicone Brush Cleaning Tank. Will this work as well The Master’s Brush Cleaner? Trying to buy all the basic materials when you don’t know what you are doing is so confusing. I wish I had found you first! Thanks for being here for all of us beginners! Hi Deborah, pleased you’re enjoying the site. I haven’t personally used the Silicone Brush Cleaning Fluid, but having a quick look at it and it looks great for cleaning oil paint from brushes. thank you so very much for all the information you are supplying. Thanks Marianne, really pleased you’re finding the tutorials helpful. If I don’t have brush cleaner, will cleaning with just water do? Yes Angelina, water will do for most of the time, you can also try adding a tiny touch of washing up liquid to produce a lather will help remove all the paint pigment from the bristles. You mention the use of paper towels. I’m trying to practice eco-friendly habits (as eco-friendly as painting will allow, lol)- can the use of a cotton cloth be an alternative? If so, how would it be best cleaned / maintained for repeated use? Thanks again for sharing your talents – so inspiring! Hi Michelle, really pleased you’ve been enjoying the tutorials, yes, washing up liquid is liquid hand wash. Yes, you can also use cotton cloth, however, the acrylic will dry hard into the cotton so will form a permanent bond and get stiffer over time as more paint is added. And the brushes I use are Daler & Rowney’s synthetic and natural hair brushes, filberts and Winton’s. Much thanks in advance Will. Hi Archana, the Masters brush cleaner can also be used with oil paints, washing up liquid also works well. I am wondering how you would recommend storing your brushes between painting sessions. I have been storing mine on the horizontal well spaced out, some i keep vertically in a cup. Im wondering specifically if storing them vertical (once dry of course, not when wet) might splay the bristles out! Hi Seb, I tend to leave brushes to fry horizontally so you don’t get excess water drain down into the ferrule of the brush but once dry store then vertically. I use hair shampoo or dishwashing liquid to clean my acrylic and water color brushes. After washing, I will leave a bit of the soap on the brushes,so as to shape the brushes. Will this cause more harm to the brushes? Hi Adeline, as long as you wash out the soap before starting the next layer of painting you’ll be fine. 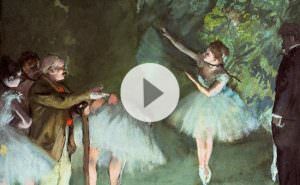 You are absolutely one of the fantastik artists who shares his knowledge in a best way. Not only you are an amazing teacher who just teaches the core of the stuff without any blah blah , but you are very nice to listen to. I absolutely admire what you do to help people like me to improve our techniques. I wish one day you would have a workshop in real where we could attend. That’s very kind of you to say so Maria, really hope you find the lessons helpful.